By and large, I’m a visual learner–I need to see it to understand it. I’m not the kind of gal who’s skilled at just “imagining” something. While books, photos, and movies are helpful, traveling and seeing things with my own eyes is, for me, the best way to comprehend a culture’s history and contemporary realities. As this is my first trip to Egypt, I’m eager to ditch my preconceptions shaped by recent media and years of watching documentaries on this country and see it for myself. My first glimpses begin with a trip back in time to Ancient Egypt. 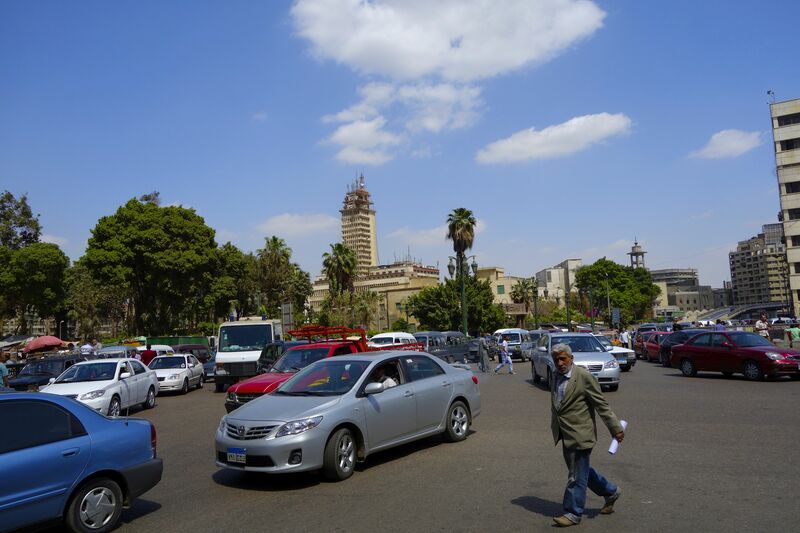 Navigating the roads of Cairo can be a tricky thing. On our first full day in Egypt, we embarked on a mini-bus trip from Cairo out to the ancient desert town of Saqqara. Our skilled driver, Mohammed, weaved through what should have been three lanes of traffic (had there been painted lanes), dodging taxis, public and private buses, 1970s Fiats and new model KIAs, engine-buzzing crotch-rocket motorbikes, and brave pedestrians who maneuvered however and wherever they pleased. In these post-Revolution times–moving from an oppressive dictatorship to a shaky and highly flawed democracy, they all know that rules no longer apply. And even if they did apply, the freedom to break the rules is all too tempting. 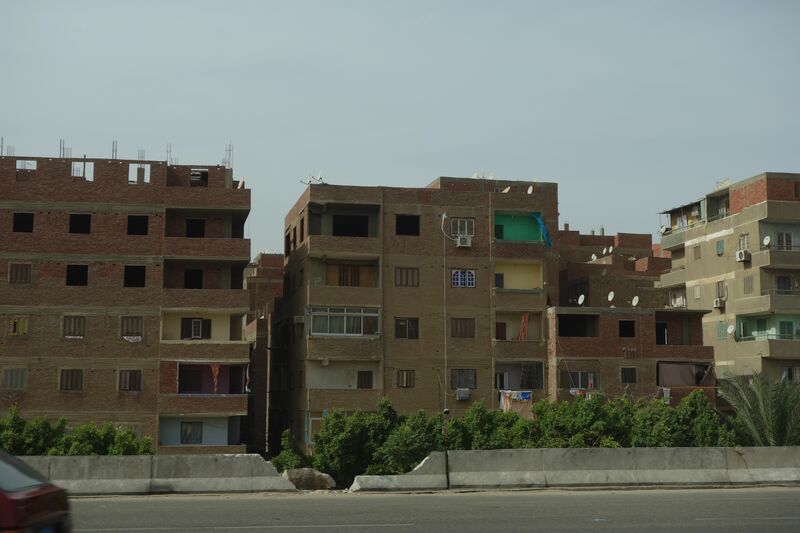 Endless rows of tenements like these stretch on for miles from Cairo to its distant suburbs. As far as the eye could see, both sides of the highway offered no other view than unfinished tenements that stood like soldiers at attention, occasionally decorated with a rainbow of clothes being hung out to dry and always accessorized with at least a half-dozen dirty white TV satellite dishes. Our guide explained that over the last fifteen to twenty years, fertile fields had been disappearing exponentially from distant villages all the way to the suburbs around Cairo. Farmlands that used to extend to the horizon were sold under the government’s nose to developers who disregarded building codes–packing in as many multi-storied buildings as possible. And since an unfinished building cannot be taxed, virtually all the buildings we saw were inhabited yet remained incomplete, bathed in years of dust–Cinderellas awaiting a fairy godmother. It made me wonder whether this was progress on pause or progress defeated. 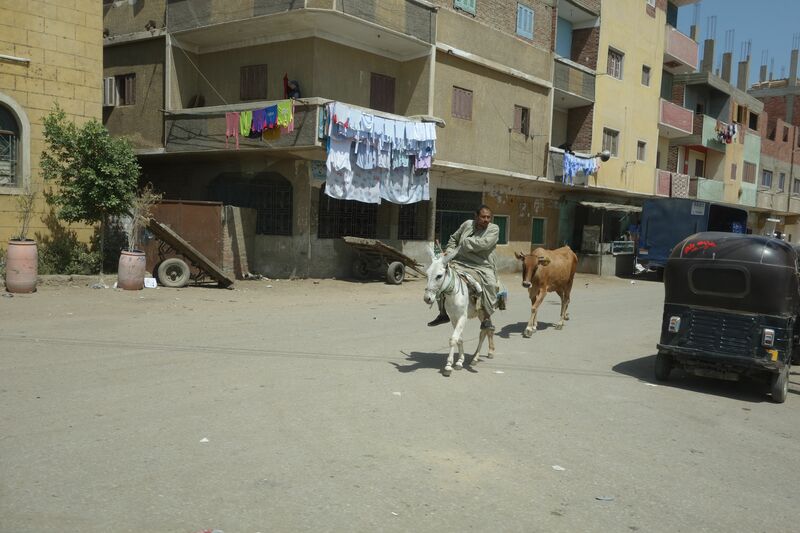 In the villages and towns heading south to Saqqara, donkeys and horses are modes of transportation. Heading further southwest through villages along canals of the Nile, the noise and population congestion of the capital gave way to once-common arable spaces, polka dotted with red-brick residences, donkey carts transporting alfalfa, and hijab-cloaked women with anything from jugs of water to bags of lentil balanced expertly atop their piously covered heads. Seeing how things are now in this area allowed me to understand how they used to be just two decades ago much closer to Cairo. 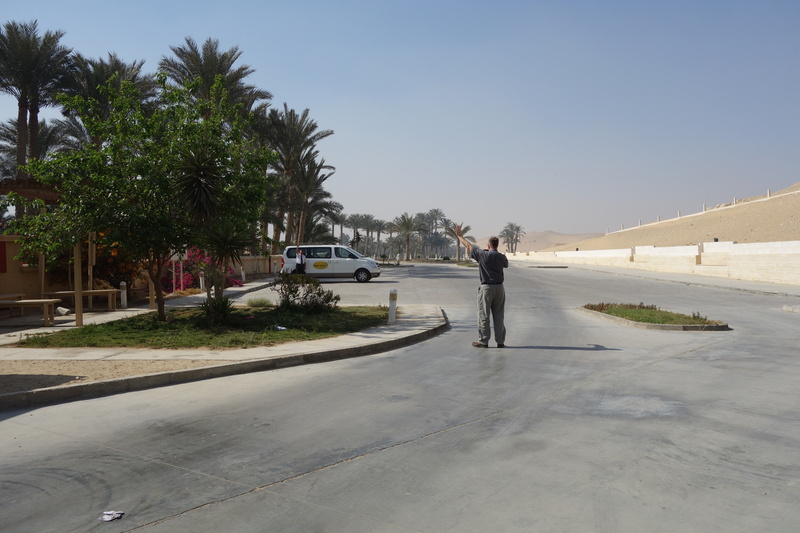 Rick waves to our driver Mohammed and to absolutely no one else in the parking lot in Saqqara. In Saqqara, a blast of heat and ancient sands greeted us as the mini-bus door opened. It was already ten o’clock, yet we were the only visitors around. Fear and bad press has kept away many travelers, and tourism is down about 80% from two years ago. It’s a shame for travelers who delay their trips here until it’s “safe” (it is safe, provided you keep your wits about you), and it’s damaging to millions of average Egyptian citizens who rely directly or indirectly on the tourism economy and who desperately need the financial stability. For us and for the rare few who are choosing now to take advantage of favorable prices, smaller crowds, and a chance to witness history in the making, it’s a brilliant time to visit Egypt. Being here, after weathering all the concerns from loved ones back home before we left, we feel almost smug. The step pyramid of Pharaoh Zoser at Saqqara. Saqqara is known for the oldest Egyptian pyramid, dating back to about 2800 B.C, the third dynasty. It’s a step pyramid, similar in shape to what you might see in the Yucatan in Mexico, and was built as the final resting place for the Pharaoh Zoser. Although it’s covered today by scaffolding and has long lost its limestone casing, it nonetheless stands majestic and proud that it has withstood millennia of desert climate and sandblast erosion. 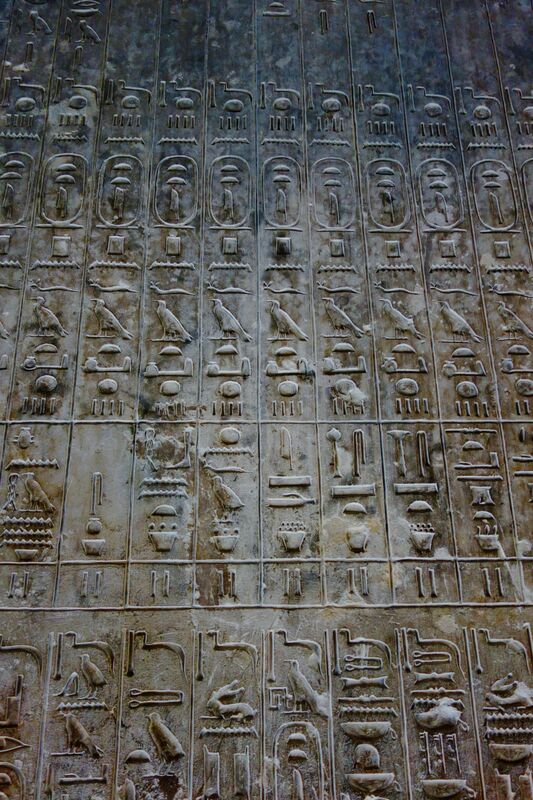 These hieroglyphics bless the nobleman Teti. While we weren’t allowed into the Pyramid of Zoser because of current maintenance, we did get to peek inside two nearby tombs of noblemen. Even though tombs and pyramids are essentially associated with death and mummies, it was surprising to me to see how the reverence of life permeated every aspect of these burial places. Painted carvings depicted daily activities of the noblemen such as hunting, fishing, music, banquets, and even manicures and pedicures. Hieroglyphics included blessings or “magical spells” that would grant the dead person an abundance of animals, food, riches, and all things good in the after life. The middle pyramid of Kephren gives visitors an idea of its former grandeur with its still-remaining limestone tip. Heading north along the West Bank of the Nile, we jumped ahead 300 years to the pyramids at Giza, which belong to the 4th dynasty. In ancient times, people generally lived on the East Bank of the Nile and buried their dead on the West Bank, symbolic of the rising and setting of the sun…and of life itself. That’s why from Giza down to Valley of the Kings in Luxor, all the pyramids and tombs are on the same side of the Nile: the West. The three great pyramids of Giza belong–in order of lineage and size–to the Pharaoh Cheops, his son Kephren, and the grandson Mycerinus. Because the middle pyramid still has remnants of its limestone casing on the tip, one can really envision the former grandeur and how for generations, these pyramids–gleaming white under the late-day light of a setting sun–were beacons of glory for the pharaohs upon whom the Sun of Life had permanently set. 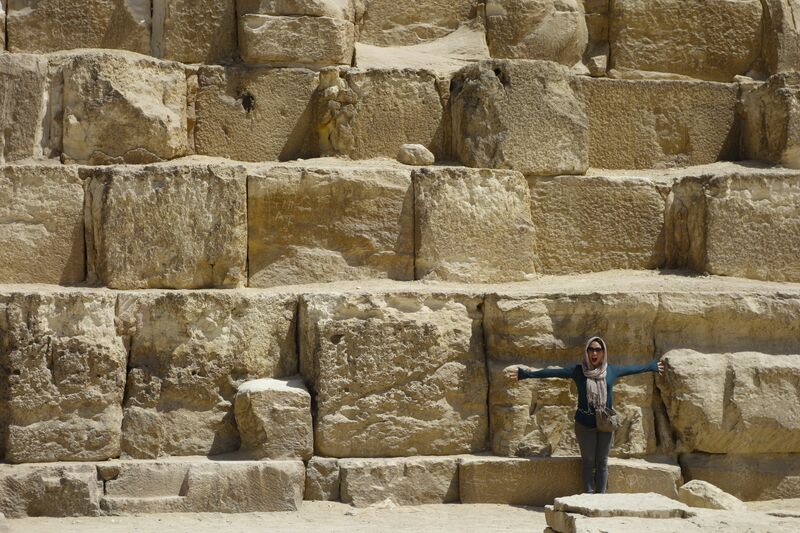 Feeling small and grand at the pyramids of Giza. These ancient structures struck me to the core. 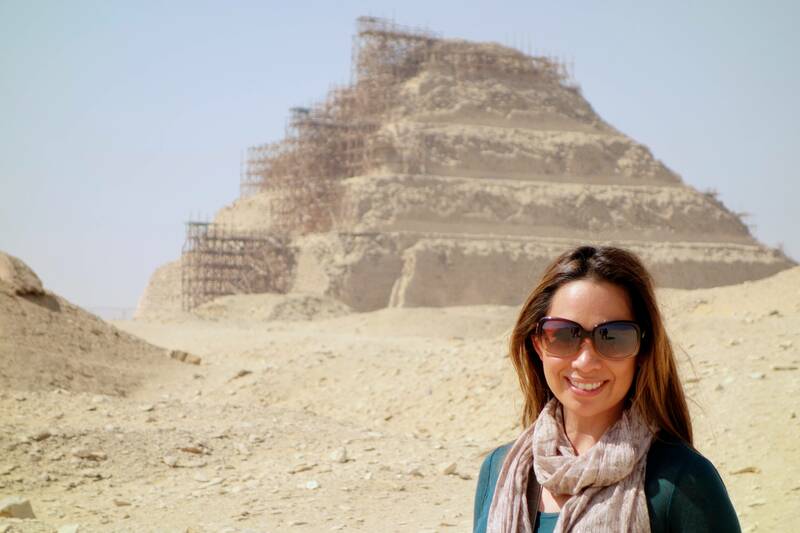 Like so many others, coming to Egypt has been on my Bucket List, even long before there were such things as Bucket Lists. With each of the over two million blocks of the Great Pyramid of Cheops weighing several tons, there is something about these edifices that can in one moment make you feel diminutive and humbled, and in the next, substantial and an integral part of a storied legacy of civilization and humankind. Rick, “Bob Marley”, and I strike a pose at the pyramids of Giza. While ancient sites were about death, the fear of the afterlife, and revering the past, the gaggle of hustlers around these towering monuments to the past can be annoying. But I found them strangely uplifting–real people, focused on finding the joy in life today…in the here and now. Like any clever entrepreneur, these merchants and camel drivers seized every opportunity to trade on the history of Egypt coupled with the hokey-ness of wide-eyed tourists…me included. 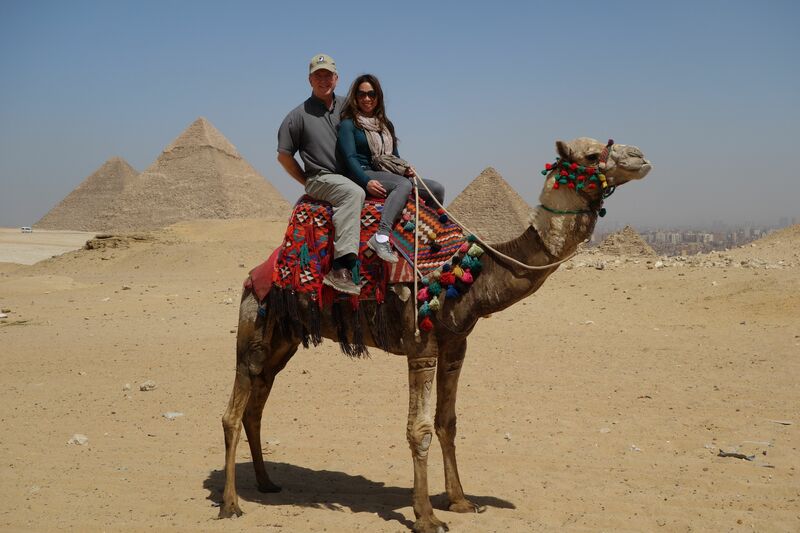 So, despite the fear of breaking our collarbones, Rick and I hopped on “Bob Marley” for an obligatory camel ride, complete with the obligatory camel-at-the-pyramids photo-op. If ever you’re going to ride a camel, there’s no place to do it like Ancient Egypt. The span of Egyptian history covers five thousand years. For someone like me who comes from an American culture whose history dates back only a few centuries, Egypt is jarring, awe-inspiring, and, at times, confusing. Gaining an appreciation for its past lays the foundation for me to learn more about its unsettled present and its path toward an uncertain yet promising future. And I’m ready for what lies ahead on this trip. Stay tuned for more stories in this continuing series on Egypt. Previous Post Welcome in Cairo! I have been wanting to visit Saqqara but have not been able to find current information about it anywhere. Some of the best sites in Egypt are deserted or unknown and there is very little information out there which is one reason I started my blog, I am really excited to read about your journey! I’ve also reblogged some of your posts, I want my followers to dispel their preconceptions and fears about visiting Egypt. I look forward to your future posts! Saqqara is set up beautifully and is easily accessible for tourists. The humble museum they have is quaint, but you’re better off seeing the antiquities as the Egyptian Museum in Cairo. 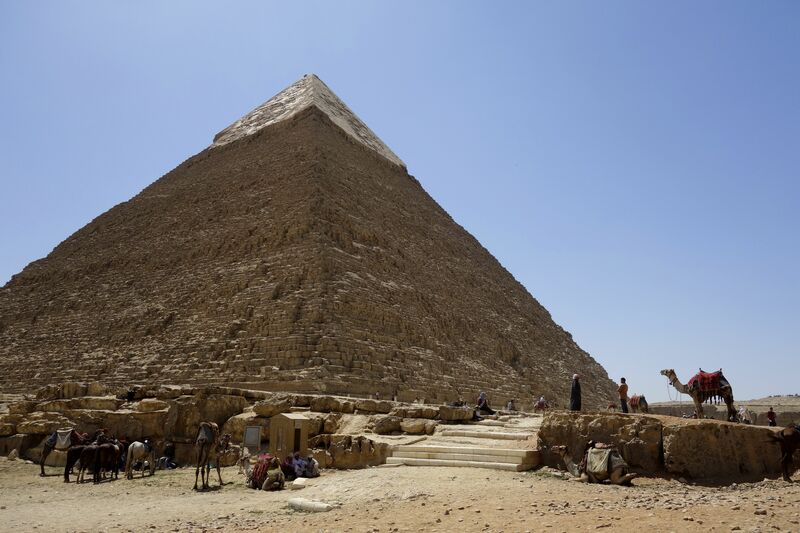 The step pyramid really is a must-see, if only to gain perspective on how the style changed from that to the style of pyramids like those in Giza–and then how/why the pharaohs switched from that to the tombs like those in the Valley of the Kings. Thanks for following along (and for reposting some of my articles). Best wishes to you on your own blog. Wow! Reading your blog entry about Egypt(Time Travel). May help my wife feel comfortable enough to finalize our plans to Travel to Egypt the end of May. Its safe for Americans. Tourist areas are safe. The people are wonderful and inviting. I hope it does help, Mike. Be sure to check out all of Rick Steves’ posts about Egypt on his Facebook page (www.facebook.com/ricksteves). You’ll get even more insight into what it’s really like there now. Egypt IS safe for Americans…and Germans, Canadians, Japanese, Russians…everyone. The price is certainly right for traveling now. You can have your pick of the finest hotels (if you wish) for bargain basement rates, and you don’t have to worry about crowds. Egyptians will welcome you warmly, not only because they need the tourism desperately, but because they truly are a warm and gracious people. I really hope you and your wife have a fantastic time in Egypt. Wonderful blog. I’ve been following your travels as we also visited Egypt & Israel in November. Ours was the last cruise scheduled to dock in Egypt until last month. We had an awesome time, wonderful weather great tour guides but only 2 days in each country. I have been sharing Rick’s videos with my friends as they truly capture all the chaos of Egypt. Like you, our friends & families were worried about our safety, but we never had any problems at all…..well, maybe trying to stay on the camel! I’m glad to hear that you had a glowing experience in Egypt, too, Dorothee. It’s important that we share our personal experiences with those who don’t have the opportunity to see what it’s like with their own eyes. I’m so fond of this culture now and have a better (although still developing) understanding of what life is like for Egyptians today. Their struggles are real and complicated–not simplistically “wrong” or “bad” or “dangerous” as people may want to pigeon-hole them. Their challenges can’t be reduced to a thirty-second soundbite on a news program, so it’s important we try to understand the bigger picture. I’m glad you’ll be able to share your own experiences with your family and friends.